The concept of a business committee to allow for negotiations over the timetables for individual bills is worth trying on an experimental basis, writes Paul G Thomas. This article by Paul G Thomas was originally published in the Winnipeg Free Press on March 2, 2018. Paul G. Thomas is professor emeritus of political studies, University of Manitoba. He is a member of the Elections Canada Advisory Board. 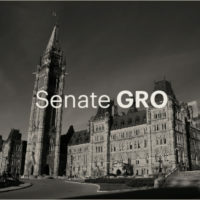 On Feb. 15, leaders representing the various party and non-party groups that comprise the Senate membership announced a timetable toward a final vote on Bill C-45, legislation that will legalize cannabis. That vote will take place on or before June 7. The agreement also specifies a completion date for second reading and the time period for in-depth study of the bill by five subject-matter committees of the Senate before a final vote is taken. This case is one example of why it is time to revise the highly negative stereotype of the Senate as a useless, patronage-based institution that has failed to fulfil its main functions of providing sober second thought on bills, representing the regions and providing scrutiny of government actions. The new, still-evolving Senate is becoming a political force to be reckoned with in the national policy process. Some brief recent history tells us what has changed. In 2014, Liberal party leader Justin Trudeau removed senators from the national parliamentary caucus, which meant they were no longer subject to party discipline. In 2016, as prime minister, Trudeau created an application and advisory process that was intended to produce a non-partisan, independent Senate. As of February 2018, there had been 32 appointments under the new procedure. As a result, the largest Senate contingent is the Independent Senators Group, which is forecast to become a majority in the Senate in the near future. Another change was the replacement of the former position of government leader in the Senate with a new official called the Government Representative (GR). The GR is expected to ensure advancement of the government’s parliamentary agenda. However, there is no longer a contingent of government senators who have participated in a parliamentary caucus and are subject to discipline by the party whip. This means that a majority must be found on each bill that comes before the Senate and negotiations must take place over the timing for consideration of government business. The first GR is Independent Sen. Peter Harder, who, before his appointment in 2016, had been a distinguished, senior public servant. Recognizing the new reality of shared power in the Senate, Harder issued a discussion paper that proposed the concept of a business committee as a forum where negotiations over the Senate agenda and a timetable for each bill would occur. The Harder paper argued that a business committee to organize Senate deliberations would reduce political gamesmanship, as well as the need to use time allocation, and it was hoped that over time it — together with other changes — would lead to a more constructive and collaborative culture in the Senate. There was an immediate backlash from Conservative senators, and even some independent Liberal senators, to the Harder proposals. With considerable hyperbole, it was argued that programming the legislative process by a business committee would destroy our Westminster model of parliamentary government by removing the adversarial component and diminishing the role of an organized opposition within the upper house. Several rebuttals can be made to these criticisms. The term “Westminster model” refers to cabinet-parliamentary systems that operate in the U.K. and in former British colonies. There is, however, considerable institutional variety among those countries. One of the presumed virtues of the Westminster model is its flexibility to adapt to different and changing circumstances in various national settings. Contrary to the critics’ view, the concept of a business committee is not alien to the Westminster tradition. It was adopted in the House of Representatives in New Zealand after that country’s 1996 adoption of a mixed-member proportional electoral system that led to a multi-party parliament and to coalition governments. The use of timetable for the handling of bills is used in the British House of Lords. While it is true that a legitimate and effective opposition is central to a healthy parliamentary democracy, there are several types of opposition that already exist in the parliamentary process. The most obvious type is the official Opposition, which is the second-largest grouping in the legislature that is recognized in statutes, rules and the provision of resources. In multi-party legislatures, it is also popular to refer to opposition parties, a term that covers all parties not part of government. Opposition can also exist within the framework of individual parties, including the governing party. Finally, opposition can arise outside the framework of parties when legislators come together on the basis of shared social backgrounds (such as region), ideologies or policy interests. The new freewheeling Senate cannot work effectively and efficiently if it becomes a free-for-all. Its structures and rules must be modified to take account of its changed composition and the more unpredictable dynamics of its proceedings. Rules are meant to be neutral instruments, but in the past several decades they became political weapons to advance or stall Senate business. To avoid ongoing political gamesmanship, the concept of a business committee to allow for negotiations over the timetables for individual bills is worth trying on an experimental basis. The case of the pot bill suggests a more constructive, collaborative approach based on compromise is possible.